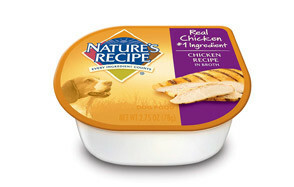 Wet or canned dog foods are one of the most expensive canine nutrition you can ever find. These are especially formulated to mimic the natural diet of pooches in the wild. Rich in moisture and fortified with all the nutrients that canids need, soft dog food can be an excellent source of nutrition for certain types and breeds of dogs. Unfortunately, because of its rather unique formulation, expect that the best wet canine food will have a hefty price tag compared to dry kibbles. Not to worry though as we’re going to take a look at the 10 best wet dog foods in 2017 that are not only highly nutritious for your pet but are friendlier on your pocket as well. 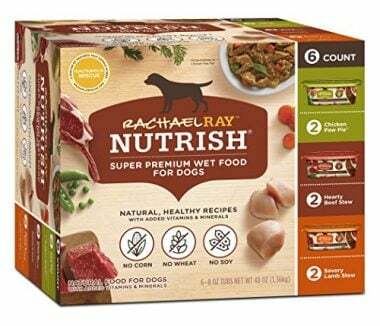 One of greatest surprises in the best canned dog food product category is the Super Premium Wet Food for Dogs from the Nutrish pet food product line of celebrity chef Rachael Ray. Each pack of the Super Premium contains two tubs or containers each of Chicken Paw Pie, Savory Lamb Stew, and Hearty Beef Stew containing only premium quality meat-based proteins and all-natural ingredients. It doesn’t contain artificial ingredients, flavors, or preservatives. The protein content may not be as high as other brands, but its unique formulation allows it to be refrigerated for up to 3 days. The Super Premium also contains minerals and vitamins and comes with no added cereal grains. Each serving contains about 78 percent moisture making it exceptionally useful for pooches that require adequate hydration. The various preparations are surely going to be a great hit for any dog. Its great taste makes this soft dog food a favorite among pet parents who want to give their dogs a meal that closely resembles human food. If you want smaller portions of moist dog food for your pet or perhaps something to mix with its dry kibbles, then the Cesar Classics moist canine food is for you. Each food tray contains 3.5 ounces of delicious doggie meals that have been especially formulated for pooches that require substantial amounts of moisture, thanks to its 82 percent moisture formulation. The drawback, of course, is that you’re essentially left with 18% comprising its nutritional value. It is for this reason that the best wet canine food should be mixed with dry kibbles as the latter typically comes with more nutrient value. 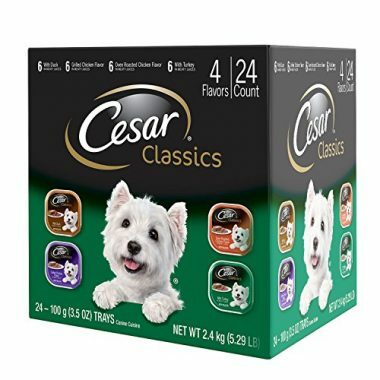 The Cesar Classics Premium Pack contains 24 trays of 4 different poultry flavors that pooches will love. There are 6 trays each of Oven Roasted Chicken, Duck, Turkey, and Grilled Chicken. At any rate, these delicacies will further enhance the way your hound chows down on its dry kibble. You can bet that each formulation is made only of the best possible all natural ingredients to ensure optimum quality. If you need some sort of gourmet meal for your pet, you won’t go wrong with the Cesar Classics Poultry Flavored Adult Wet Dog Food. 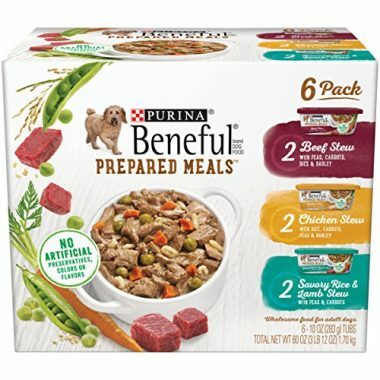 Purina is a well-established brand of pet food and its Beneful Prepared Meals Stew Variety Pack Wet Dog Food simply carries on this tradition of high quality doggie chow. This soft dog food is actually a collection of 3 different prepared meals in a delicious stew formulation. It includes three 10-ounce tubs each of Beef Stew complete with peas, rice, barley, and carrots; Chicken Stew mixed with carrots, rice, barley, and peas; and Savory Rice and Lamb Stew adorned with carrots and peas. 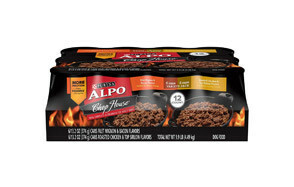 Each packaging is formulated with only the finest meat-based proteins as its primary ingredient. The addition of wholesome grains like rice and barley help provide the healthy carbs that pooches need. Beneful also comes in medium-sized chunks to help provide for a more pleasant canine dining experience. Purina’s Beneful is an exceptional choice for a moist dog food if you need higher proportions of protein in your pet’s chow. Everyone knows Blue Buffalo for its LifeSource Bits formulation in its dry kibble preparations. 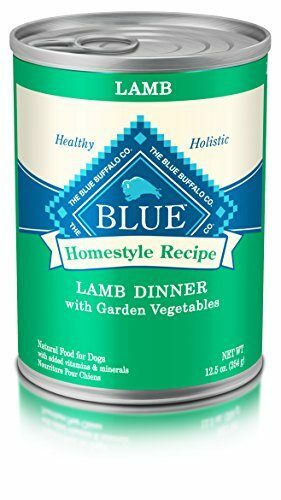 While such technology is absent in the BLUE Homestyle Recipe Wet Dog Food, you can bet the Blue Buffalo uses the same passion in making dry kibbles in the formulation of their moist canine food. The Hometyle Recipe comes in various flavors such as lamb, chicken, beef, and turkey with each one comprising the principal ingredient of their respective formulations. Hearty whole grains have also been added to give dogs the kind of readily available energy they need. Cranberries and blueberries as well as sweet potatoes and carrots have also been added into the mixture to help enhance its nutrient profile. If any, it is its ideal omega-3 to omega-6 ratio of 1:4 that is really commendable. By comparison, we humans typically have 1:10 to 1:15 omega-3 to omega-6 fatty acid ratios, which is a major risk factor for many inflammatory conditions. At least, the Blue Homestyle Recipe soft dog food will help make sure your pet gets the ideal ratio of these essential fatty acids. Another Blue Homestyle Recipe takeaway is the inclusion of glucosamine, a substance needed for healthier joints. Purina’s Beyond Natural Grain Free Ground Wet Dog Food Variety Pack is a collection of 3 different gourmet meals designed specifically for today’s canine breeds. It comes in ground meat instead of the usual bite-sized portions, making it more convenient for pooches that may have problems chewing or those that are in a significantly weakened state such as recovering from an illness, labor, or surgery. There are 6 cans that come in the Variety Pack, 2 each for the 3 different flavor recipes that include salmon, chicken, and beef as its main ingredients. 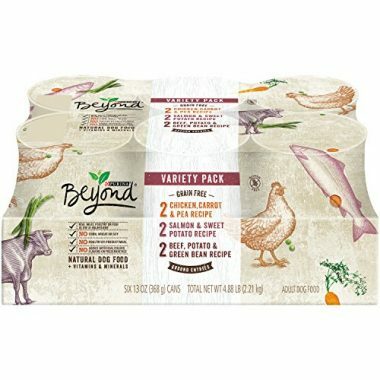 Aside from premium quality animal protein sources, the Beyond Natural also comes filled with healthy grains and veggies like sweet potatoes, carrots, green beans, potatoes, and peas. Its salmon variety offers an exceptional source of EPA and DHA, 2 of the more important omega-3 essential fatty acids. On the downside, the Beyond Natural has slightly lower minimum protein content compared to the other products in this list. It is thus, recommended that this moist canine food be combined with your pet’s dry kibbles to help augment the nutrient profile of the soft dog food. If any, you should be glad to learn that it doesn’t contain any of the cereal grains that most dog owners are quite wary of. 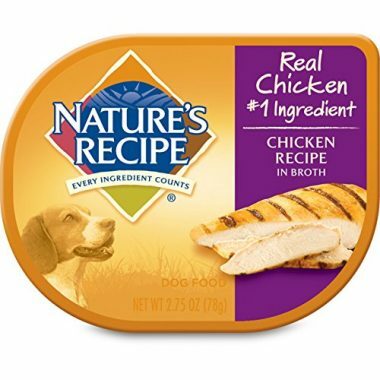 The Chicken Recipe in Broth Wet Dog Food from Nature’s Recipe is a low-calorie and low-fat preparation that stakes its claim as the best wet canine food for its superb 82% moisture content. While it may only contain at least 11 percent protein, you can nevertheless feel safer about its high quality. Also added into the mixture are brown rice and carrots to give your pooch a rich source of vitamins and minerals needed for optimum health. And since Nature’s Recipe essentially comes with a luscious broth, you can somehow mix this with your dog’s dry kibbles to make the latter more palatable and to help improve the nutrition that your pooch is receiving. One great thing about Nature’s Recipe is that it already comes in 24 cups, each containing 2.75 ounces of delectable chicken recipe. It also boasts of no added wheat and corn. The label says it doesn’t contain beef which gives us the impression that it is being marketed as a hypoallergenic diet for pooches. Unfortunately, it somehow misses the mark entirely since chicken is also a known allergenic. You can always count on Pedigree to give you an exceptional product for your pet and its Chopped Ground Dinner Adult Wet Dog Food is one of them. Using only a combination of premium animal proteins in its list of primary ingredients, the Pedigree Chopped Ground provides a more balanced nutrition for pooches that need ample hydration. 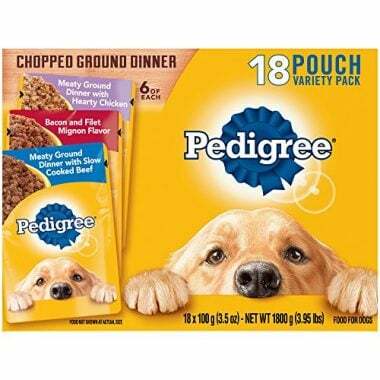 This Pedigree soft dog food is available in 18 pieces of 3.5-ounce pouches featuring 6 pouches each of chicken, fillet mignon and beef, and slow-cooked beef. The formulation is not finely ground, giving a certain texture that will prove very pleasing to a dog’s palate. 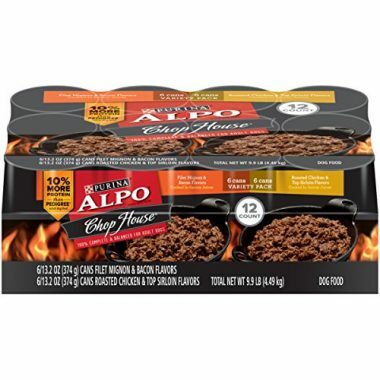 Being a product line of Purina, one can expect only the highest possible quality dog food in the ALPO Chop House Wet Dog Food formulation. The set comes as 12 pieces of 13.2-ounce cans that should be enough to last your pooch a few weeks of highly nutritious and truly delicious meals. This soft dog food preparation comes with savory juices to help provide for a more delectable meal, just perfect for sick dogs that may have their taste buds slightly altered because of medications. 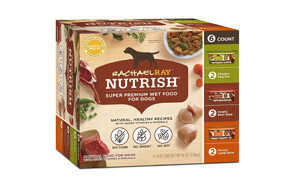 Each can contains real meat sourced only from natural ingredients and utilizing the technology that Purina is known for. 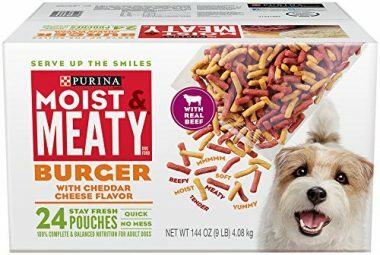 If you’ve ever been wondering if you could give your pet that burger with several thick slices of rich cheese inside, now wonder no more as Purina gives you its own version of a cheeseburger formulated specifically for pooches. Each 6-ounce pouch contains the highest amounts of proteins and the lowest amounts of moisture in this list of the best wet canine food. At a minimum of 18 percent and maximum of 33 percent protein and moisture, respectively, the Purina can be considered as a cross between a moist dog food and a dry kibble since its protein content is just shy of that contained in dry kibbles yet its moisture content is more than half less than what other soft dog food contains. This gives the Moist & Meaty Burger with Cheddar Cheese Wet Dog Food one of the truly well-balanced and highly nutritious diet preparations you can ever buy for the pooch in your life. That being said, it’s the perfect meal, topper, or snack to any gourmet-loving canine. 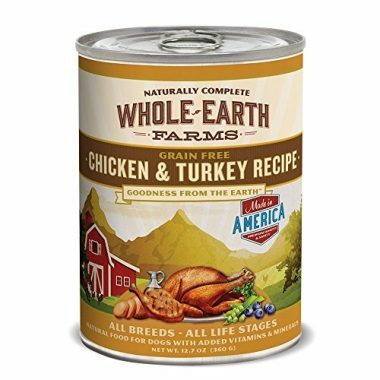 What separates Whole Earth Farms Naturally Complete Grain Free Recipe Canned Dog Food from other brands is the inclusion of essential oils in its preparation to give it more modest amounts of healthy fats at 6.5% minimum. This gives the Whole Earth Farms moist dog food a healthier profile than most dog chow of the same type. Its main ingredients are also sourced from real meats for higher quality animal proteins. Whole Earth Farms makes a great choice for those who seek value in their pet food. Choosing the right wet and canned dog food often entails careful consideration of a variety of things. These types of dog food are not inexpensive and as such may not really be a good idea for those whose primary concern is the economy of feeding their pets. However, if such is not really a concern to you, then you will have to understand the very nature of wet dog foods, especially when compared to a dry kibble. The nutritional composition of wet dog food is one of the few things that you really have to understand as it may not fare well compared to dry dog food. As such, even before we help you identify the things you have to look for when buying wet and canned dog food, it is essential to understand the unique differences between dry kibbles and wet dog food. Hopefully, by then you will be able to make a more reliable decision as to the kind of wet dog food that you are going to purchase. 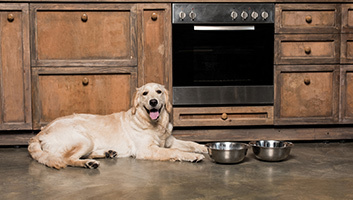 The debate between dry and wet dog food has been going on since pet food manufacturers have begun dissecting the anatomy of the ideal canine diet. On one hand, there are those that say canned wet foods are better since they contain moisture that can help keep dogs stay hydrated. On the other hand, those who say that dry kibbles are better essentially point to the greater nutrient value per kibble. Choosing the right food for your pet requires an understanding of these two basic types of doggie chow. Proponents of the dry kibble maintain that, given on a per weight basis, dry kibbles contain more nutrients than wet dog food for the simple fact that it has lesser proportion of moisture which is essentially water. For instance, if you have 100 grams of dry kibble that contains only 10% moisture, this means that the remaining 90% are actually the dry matter ingredients – proteins, fats, and carbohydrates. Typically, a dry kibble will contain a minimum of 30% protein and 15% fat accounting for at least 45 grams in our example. This leaves us with another 45 grams to make the remaining 90 grams of nutrients. Does this mean the 45 grams are actually carbs? Or does it account for fillers? The good thing is that the macronutrient content is always expressed in the minimum for both protein and fat and maximum for moisture and fiber. But providing limits doesn’t give you an actual figure to work with. Nevertheless, dry dog food has quite a number of advantages. It’s more economical and a lot more convenient to give to dogs since they don’t spoil that easily. You can pour a cupful into your dog’s bowl in the morning and still feel safe that it won’t be spoiled once you come home from work. The rather hard and rough texture of the kibbles also serves as toothbrush for your pooch to help enhance its dental and oral health. On the downside, you don’t get to provide adequate hydration for your pet. This should not really be a concern especially if you can get your dog to drink from its water bowl or even its pet fountain. The major issue with wet doggie chow is that they contain too much moisture that its nutritional value is generally considered less than a dry dog food. In our example of a 100-gram preparation, let us suppose the moisture content is 80%. This essentially means your dog is left with only 20% of the food accounting for its nutrients. That is why if you’re going to look closely at our list of the 10 best wet dog foods in 2017, you’ll notice that the minimum amount of protein is between 8 and 11 percent with the exception of Purina’s Moist & Meaty Burger with 18 percent. Still, this is still a far cry from the minimum 30% protein in dry dog food. Additionally, moist dog food is inherently more expensive than dry kibbles for the simple fact that the processes involved are more technical. Moreover, they spoil easily. Once spoiled, you simply cannot give them to your pooch anymore, further increasing the cost. This is not to say that wet dog food is bad for pooches. On the contrary, these food items are very useful in dogs that do not drink too much as well as canines who are sick, debilitated, or are recovering from an illness, injury, or even labor and delivery. It is also exceptional for senior dogs whose taste buds and sense of smell may already be decreased. Giving them moist dog food can help them eat a lot better since these types of food are way more palatable and more delicious than dry kibbles. These mimic the food that we eat. No wonder pooches love them. Given that both dry kibbles and wet dog food have their advantages and disadvantages, it is not uncommon to see pet owners combine the two. The rich moisture content and exemplary taste of wet dog food will blend well with the nutrient-dense, albeit bland formulation of dry kibbles. Mixing the two is like giving your pet the best of both worlds. In case you would like to look for your own moist canine food to give to your pet, here are some things you need to look for. The first ingredient should always be an animal protein. As a matter of fact, you need to read the first 5 ingredients to make sure that its protein source comes from a specified animal. Don’t go for those labeled as ‘meat’ alone as there is no telling what kind of animal was used. Go for products with very clear animal source labels such as ‘beef’ and ‘chicken’ among others. While this is just a very rough estimate of the nutrient composition of the dog food, it should give you an idea of just how much proteins, fats, fiber, and moisture you’re giving to your pet. Always go for higher minimum crude protein content. These are excellent sources of vitamins and minerals while whole grains provide energy for your pet as well as certain essential amino acids that can help augment those found in animal proteins. You really shouldn’t give any product that is laden with artificial ingredients as well as any other harmful chemical that are typically added to add flavor, color, and even to prolong the shelf life of the product. While you may think that a small dose is okay, these can still pose a threat to your pet’s health. Wet dog foods provide pets with exceptional amounts of moisture in a formulation that closely resembles the taste and consistency of human food. While these are more expensive than dry kibbles, they are nonetheless valued in certain types of dogs that will benefit more with a moisture-rich and delicious doggie meal. However, because they do contain lesser concentrations of nutrients than dry kibbles, you might want to give more moist canine food if not to mix it with dry kibbles. At any rate, wet dog food can be very valuable since they do mimic the kind of food that their human masters eat.